Silicone Cooking Gloves, Meat Shredder And Baster Set Just $17.95! Down From $60! You are here: Home / Great Deals / Amazon Deals / Silicone Cooking Gloves, Meat Shredder And Baster Set Just $17.95! Down From $60! You’re gonna need this! Amazon is currently offering this Silicone Cooking, Gloves, Meat Shredder And Baster Set for just $17.95 down from $59.95 PLUS FREE shipping with Amazon Prime or for orders over $25! Silicone is a material that can withstand heat of up to 425 Fahrenheit before getting heat damaged. But this can be misleading because it cannot deflect all that heat! 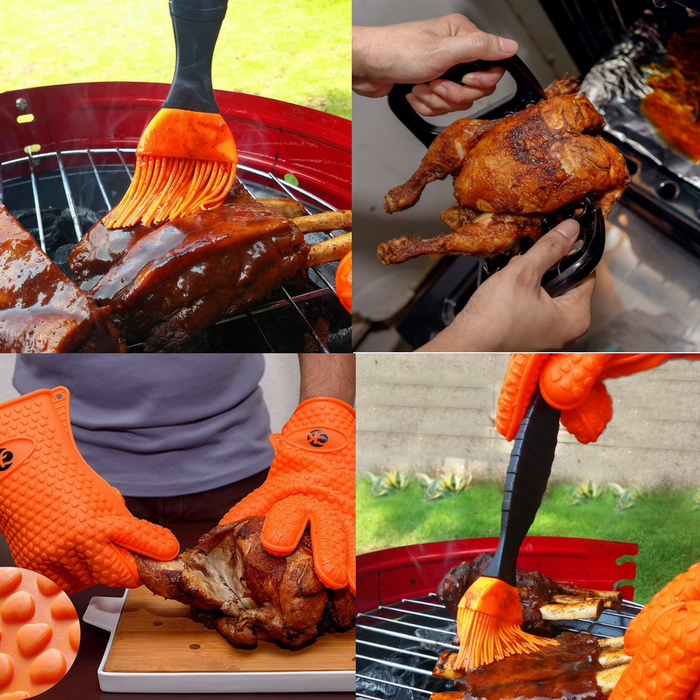 However, Silicone BBQ grill/cooking/baking gloves are better than regular mitts and fabric cooking gloves! The meat shredder is perfect for lifting hot meats while the basting brush is convenient, efficient, lasting and leaves no bristles on food! This is a great value pack at a reasonable price! I’ m sure you’re going to need this holiday season! SUPERIOR VALUE SET – 3 great top selling products very reasonably priced with 100% money back satisfaction guarantee! You have Zero chances of going wrong with a GK! BEST QUALITY – We guarantee our Quality is at par with the very best but with added value and guaranteed quick response customer service. If we don’t answer you in 24 hours, expect a gift from us! SILICONE GLOVES – 425F max operating temp, non-slip surface, water proof, stain and odor resistant, food grade for handling hot or frozen foods directly while protecting your hands from spills and burns and preventing accidents from slips. Washes easily and dishwasher safe. MEAT SHREDDER – shredding pulled pork and other meat is child play! Perfect for lifting hot meats too! SILICONE HEAT RESISTANT 8.5in BASTING BRUSH – Convenient, efficient, lasting, no bristles left behind on food! Use with gloves to sauce up food on the grill. 3 RECIPE EBOOKS – GK’s “22 Exciting Recipes for GRILLING AND BROILING”, GK’s “22 Exciting Recipes for ROASTING AND BAKING” and “300 Recipes For The Grill”. You will always have something new and interesting to try and to enjoy.